in Vancouver, Canada. He returned to the University of Manitoba and after graduation in 1973, as a medical doctor, he became a resident at Stanford in their plactic surgery program. 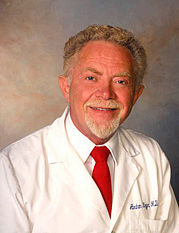 He later expanded his expertise to include the field of Holistic Medicine. Currently, Dr. Kryger practices Preventive Medicine in a small Monterey, California office overlooking the bay. This modest location belies his more than 35 years of experience, which included a fellowship in France, Switzerland and Israel, a year as a hospital administrator in Los Angeles, and a side breath of specialized interest ranging from nutritional therapy and endocrinology to acupuncture. and now The Monterey Diet™, Seven Steps Worth Taking (2009). More than 13 million U.S. men suffer from testosterone deficiency. It jeopardizes not only sexual and reproductive health, but also the cardiovascular system, bone and muscle strength, memory and emotional well-being. And increasingly, younger men are at risk. What can men (and the women who love them) do to avoid this condition? How can those who have been diagnosed improve their quality of life? The key culprits are estrogen-like manmade chemicals that permeate our air, water and food supply. "The link is undeniable, I've seen first-hand how synthetic chemicals can disrupt endocrine and reproductive systems. They threaten our fertility, our intelligence--our very survival. But there's help for those with low testosterone, and hope for others who want to minimize toxic exposure." Based on current medical and environmental evidence, 'Listen to Your Hormones' cuts through the hype and confusion about the vital role that testosterone plays in key bodily functions. It explains the consequences of ignoring hormone imbalances, and charts a course for men who must navigate the uncertain waters surrounding testosterone therapy.